You are going to create the front of a box of cereal. 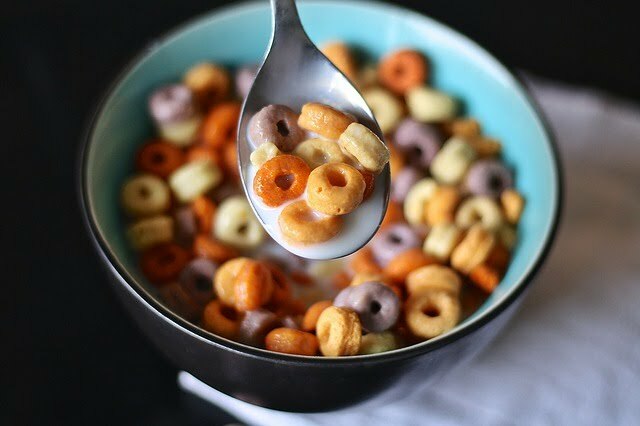 have a slogan for the cereal such as The Breakfast of Champions, Kid Tested, Mother Approved, Snap, Crackle, and Pop, or They're Magically Delicious. Think about your market. Who is your cereal intended for? Kids? Adults? People wanting flavor? People who want a healthy cereal? Think about the colors. Who is your market? As a general rule, bright colors appeal to children and darker, more muted colors appeal to adults. Browns and greens are often connected with something healthy or natural. Think about your fonts. You should probably have only two; one for the name of the cereal and another for the rest of the text. Larger, more balloon-like fonts are usually associated with children, and more formal type, like Times New Roman or Arial, with adults. Think about your layout. Why do you put your cereal picture where you do? What's the first thing you want people to see, the name or the image? Which is the most important? Why?